When I looked at my website traffic and Pinterest analytics in January 2018, I felt sick to my stomach. My numbers in Q4 2017 (for traffic and pins), had absolutely TANKED. Like not a little bit - like oh-my-damn bad. After catching my breath, I started investigating why. Turns out, the drop in traffic coincided with a new set of graphic design templates and branding refresh I had done in the fall. Cool colors, grayscale, and lots of white space were what I was attracted to and I felt best reflected me and my brand. Pinterest users didn’t like it at all. I knew I needed a branding refresh (even though I had just done one - argh), and I knew I needed to start with Pinterest. I knew from lots of reading and research that the whole pink, white, gold aesthetic does well on Pinterest. Trouble was, that was a hard pill to swallow for me. I’m not a pink kind of girl. I tend to buck the #bosslady trend and anything that feels overly feminine. But I was considering pink as part of my brand colors and I couldn’t quite believe it. I created a secret board on pinterest and starting filling it with pin graphics, colors, scenes, and photography that I loved. I downloaded the pictures of the images I was most drawn to and used a few color-picker apps to start putting together some color palette options. I belong to a couple of mastermind and entrepreneur groups on Facebook, and I created polls with my color palette options to see what resonated with people. I then created 4 different pin graphic templates inspired by both best practices and what tends to do well on Pinterest. With the top two palettes I created several pins that linked to my highest-converting content on my website. I promoted those pins for a full 4 weeks to see what would resonate with my Pinterest audience. The top two performing pins were a mix of coral and soft blue - I could live with that! As luck would have it, I came across a free mood board workshop while I was wrapping up my Promoted Pins. This was the perfect timing and opportunity to refine what I had come up with and nail down my final branding. I realized that while I knew what I was drawn to and what I felt best reflected me, that wasn’t necessarily what my client was drawn to. Pinterest is an aspirational platform. People go there to research and dream about how to be and/or do something better. So what do I want my clients to FEEL like when they work with me? Do you feel all those things when you look at this collage? I sure do. So while my mood board might not be an exact reflection of me (it’s admittedly softer and more feminine), it reflects both elements of me AND my audience. 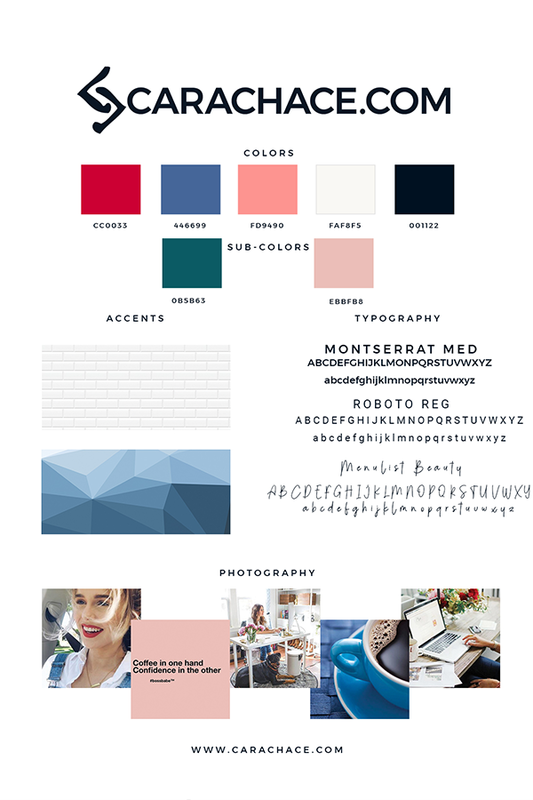 I used my mood board to create a style guide for my reference, as well as anyone I outsource to. I have already incorporated my new style guide for all my content marketing images, and am refreshing my website to reflect those changes as well. In continuing the “right place, right time” vibe, I also came across an awesome new membership site for stock photography called Girl Boss Stock. While some of the photos are still too feminine for my new branding, there are a ton on there that are right up my alley. She adds to the gallery constantly and I unveiling scene creators as well! I’ve been very hesitant this year to invest in software and memberships, but the Girl Boss Stock membership has paid off in spades. Not only have I saved SO. MUCH. TIME. not endlessly scrolling through free stock photography sites, but the images are on brand and she loves getting feedback on what members need. If you are looking for a minimal investment in brand images as you do your own brand refresh, definitely check her out. All this month in Pinterest PowerUp we’re talking about graphic design and branding for your Pinterest strategy and marketing. We have a super special guest expert - Kara Fidd of Simplifying DIY Design - who is going to teach our VIP members about the elements of a well-designed pin graphic, plus common mistakes. The whole point is that I want you to spend less time marketing so you can get back to the priorities that bring you joy in your life.